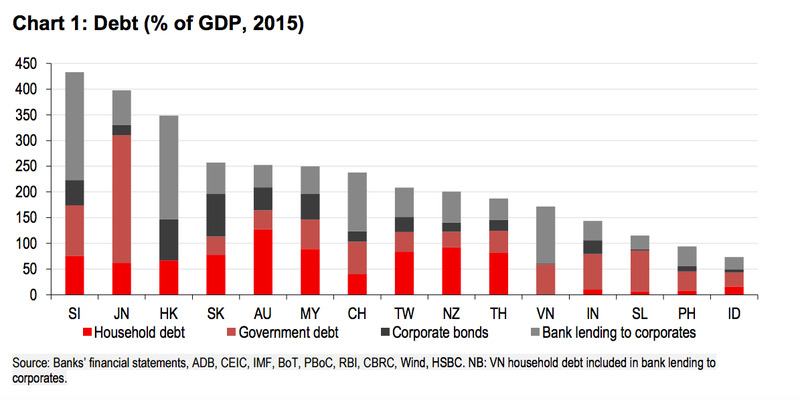 Asia has a debt problem and it’s not just in China. While China is the focus of a lot of investors’ worries about the level of its debt, it’s not the most highly leveraged country in the region. 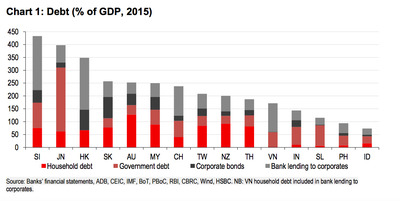 As HSBC analysts point out in a round up of Asian debt trends, Korea, Australia, and Malaysia have higher debt-to-GDP ratios, and each have “elevated” levels of household debt. Meanwhile the usual suspects of Singapore, Hong Kong and Japan still register at the top of the debt scale thanks to their booming financial centres and international lending. That said, China still leads the class on debt added since 2008, with the worry being that the country has become too dependent on credit as fuel for its economic growth. The worry is that growth across much of Asia continues to be highly credit dependent. That can’t go on forever: the higher debt-to-GDP ratios climb, there more likely a sudden, and painful, correction becomes. At the same time, the edifice isn’t quite as brittle as sceptics often argue: debt, after all, has still increased over the past year despite relentless financial volatility. Also, it’s not as if everyone has leveraged up to the same extent. If you are worried about what debt in general means for the region’s growth prospects, then Indonesia, India, and the Philippines may be good places to hide.